My husband would like to get a truck. I would too. Who knew that trucks hold their value so well?! Not us. We know that now. We have been saving for a few years, anything extra at the end of the month and we have managed to save $10,000 – which is not going to buy much of a truck – we’d need double that to get something that will last us a few years. The little green car will need some work put into it this fall – and honestly, the repairs are not worth it if we plan to sell it. Which means, we are in the market for a newer vehicle. Although my husband would really like a truck, we have decided the ‘adult’ decision would be to get a car instead, as they are cheaper, and we can pass it to our son who will be driving (gasp) in 6 years (ohmygosh, I can’t believe he will be driving soon….ahhh!!!). With new resolve, we began looking on Craigslist for a 4WD car with lower miles, and only a few years old. Imagine my luck when not an hour earlier someone had posted a gorgeous sedan, a few years old, with only 30,000 miles on it – asking only $13,800, claiming he was a very motivated seller. The blue book on this car was mid $14,000′s. My bargain hunting ears were fully listening. Just what I like to hear – someone who took really good care of his car and was motivated to sell and offering a deal. Of course we had to go check it out. We were the first people to call him and went to go look at it last night. It was beautiful. Really – just like his Craigslist post said. We talked him down to $13,400 – even better deal. Then we shook hands and said we needed to talk about it first and he said he would hold our place in line, but he did have a handful of others interested. We talked about it the whole way home. What would you have done? It’s now the next day and we don’t have the car. I’m super sad, but feel like it was the right decision. I had this crazy dream last night about Dave Ramsey shaking his head at me and saying “When will you learn?” and then right after that the roof was blown off our house. For those of you who are familiar with Dave Ramsey, he teaches about this thing called ‘Murphy’s Law’ and buying a car that we can’t afford is like asking ‘Murphy’ to move into our spare bedroom. You see, the only way we could’ve purchased that car with CASH was to take the $10,000 we had saved for it and then dip into our Emergency Fund for the rest. I don’t care who you ask, buying this car is not an emergency. Both of us feared that if we did take money from our Emergency Fund that a real emergency would take place and we wouldn’t be able to pay for it because we just bought a new car with the emergency money. 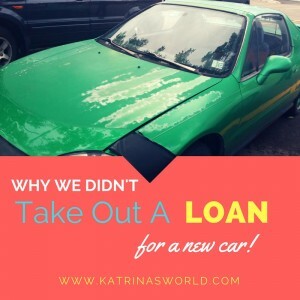 We also had the option of taking out a small loan to pay for the extra, but by the time we paid off the interest this car that was such a ‘great deal’, was not as good of deal anymore. I’m sad that we missed out on this car and am hoping that when the time is right, we will find another great deal. BUT, I’m still bummed and hate having to make ‘adult’ decisions. So, do you drive a Dave Ramsey-mobile? I’d love to see a photo of it! You can upload a photo of it on my Katrina’s World Facebook Page - just tag #DaveRamseyMobile and tell me all about it! I’d also love to know what you would do in our situation?! Tell me all about it – whether you agree or not!